I came across Chideock’s catholic church by chance some years back. A little path leads to a door flanked by two arches, a simple entrance not unlike a romanesque church that reminded me of a 13th century chapel you might find in the South of France. As you walk on, emerging from under a canopy of leaves from the tall trees either side of the path, color hits you. There is Mary, her eyes raised to the sky above, as many a Catholic artwork. But this white statue above the door is against a painted backdrop of blue sky and golden stars and around her in a large roundel, eight painted medallions make a huge statement “This is a church like no other’. It is a Catholic Church so you can expect Jesus on the cross and many a statue of Mary. Built in the 19th century, you won’t be surprised to find all sorts of artistic styles. That, and its interesting history, is what makes Our Lady Queen of Martyrs and St Ignatius of Loyola unique. 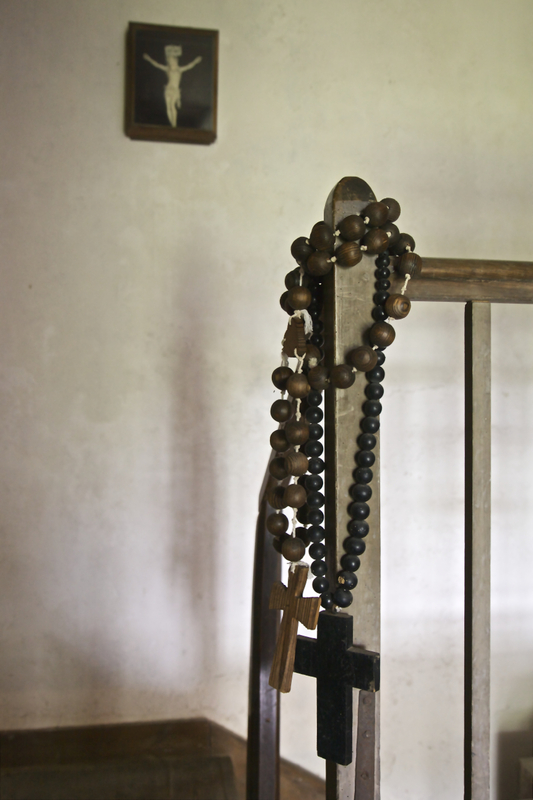 Raised in France where Catholicism is the main religion, it was fascinating to not only discover an extraordinary building but also its history, part of a bigger story of persecution. Hidden from the road by greenery, it feels like a secret venue but its apparent initial simplicity is lit by sparks of eccentricity and eclectic international artwork. I’ve got a thing about churches, about what used to be, in most places, the centre of the community. Art and architecture draw me in, the people who built it make me want to stop, look around and listen. 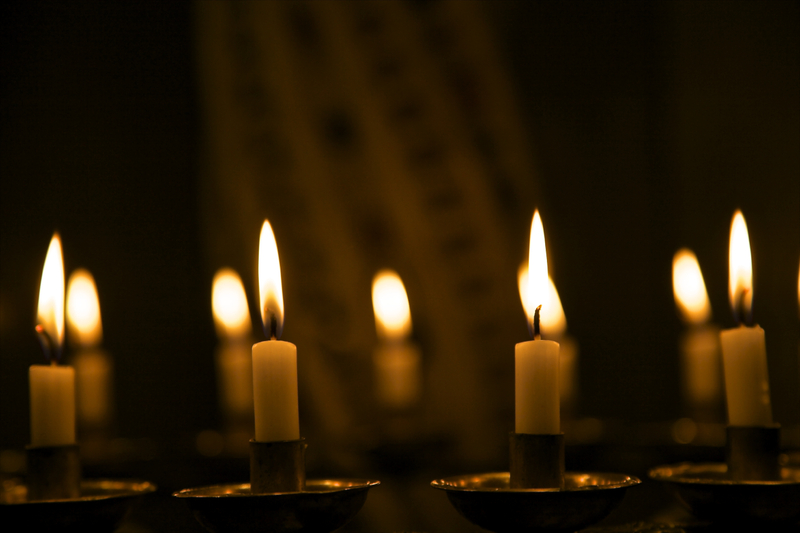 Raised by a Catholic family, I still light a candle and have a little thought for the ones I dearly miss. Of course a Catholic church in England is not the centre of the village, it is the centre of a community that used to have to hide and Chideock is no exception. Thomas Weld of Lulworth bought Chideock estate in 1802 for his son Humphrey at a time when discretion was still called for despite the Reformation. 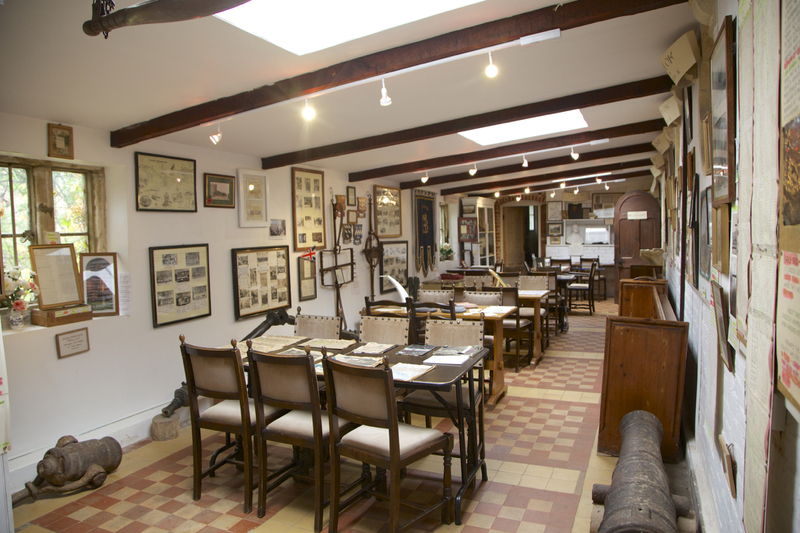 When the manor was built in 1805, the existing barn’s loft became a tiny chapel, it can still be visited today (by appointment). Its paintings, traveling altar and minute size tell a story of hiding. 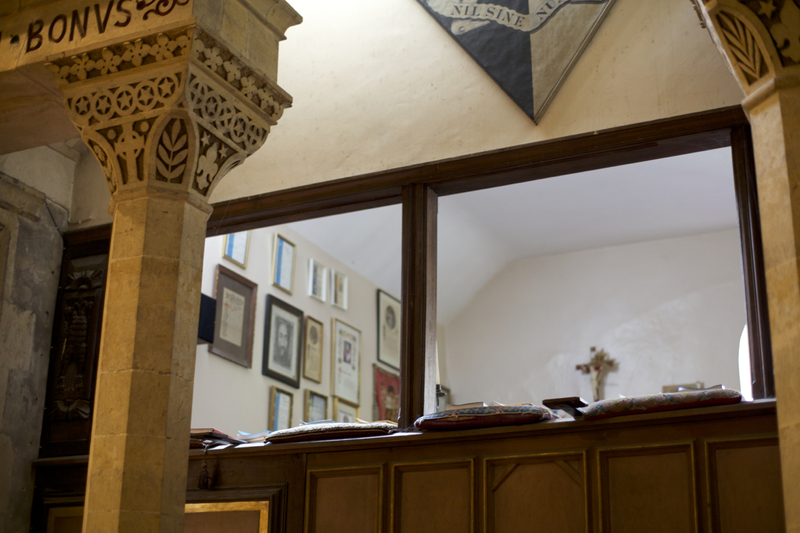 The walls of what is now the priest’s sacristy below the loft are totally decorated with murals and a 1929 painting by Fra Newbury of the Chideock Martyrs is inspired by portraits of the martyrs that can still be found around the church’s nave, below the upper windows. What is unique about Chideock is that there was no architect involved. Charles Weld, Humphrey’s son, designed it and decorated most of it himself, with some help from his family. Look closely and you’ll find a painting in an arch that was never finished, an almost ghost like figure; or Baroque inspired, slightly over the top, short white twisty marble columns encrusted with shiny stones and mosaics. 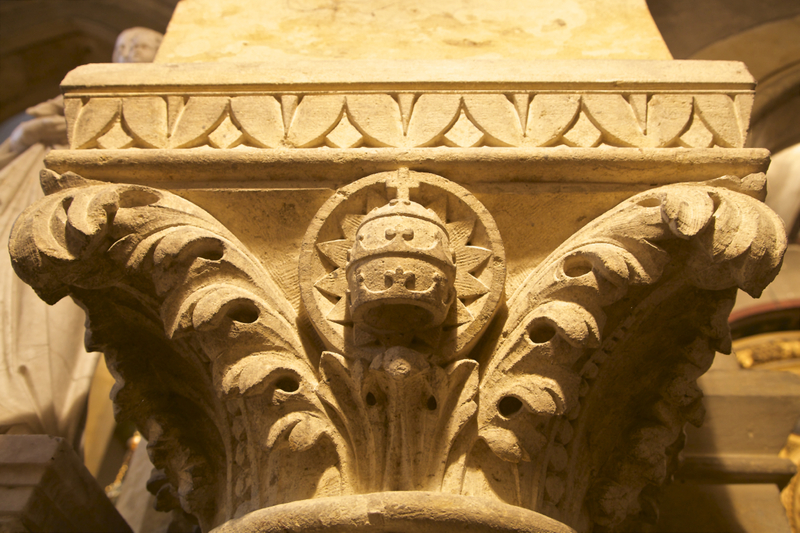 You may think Corinthian when you observe the tall columns that hold the arches of the nave but look closer and its capitals (the sculptures at the top of the columns) are all different and were carved by Charles himself. Several of the sculptures that catch your attention when you walk around were gathered during his travels. 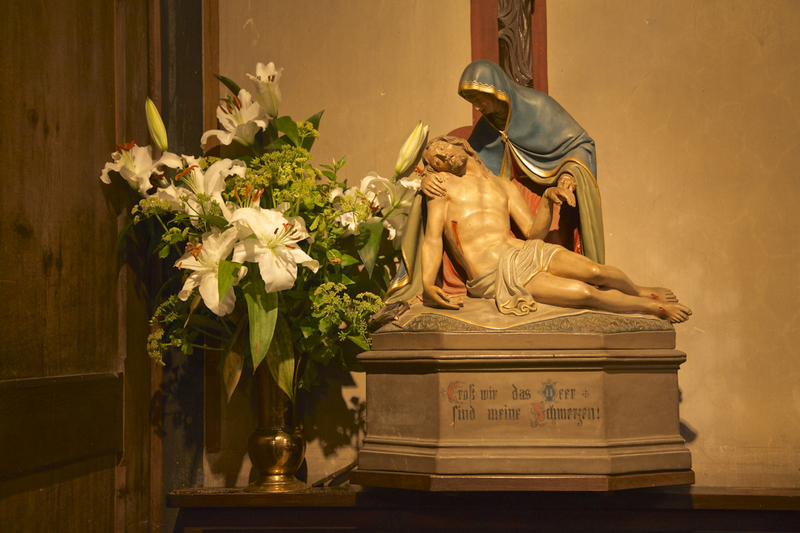 The German inscription on the painted Pieta at the back of the building is a giveaway to its origins and the white marble statues of Mary and St Joseph flanking the sanctuary at the front of the building are unsurprisingly Italian. 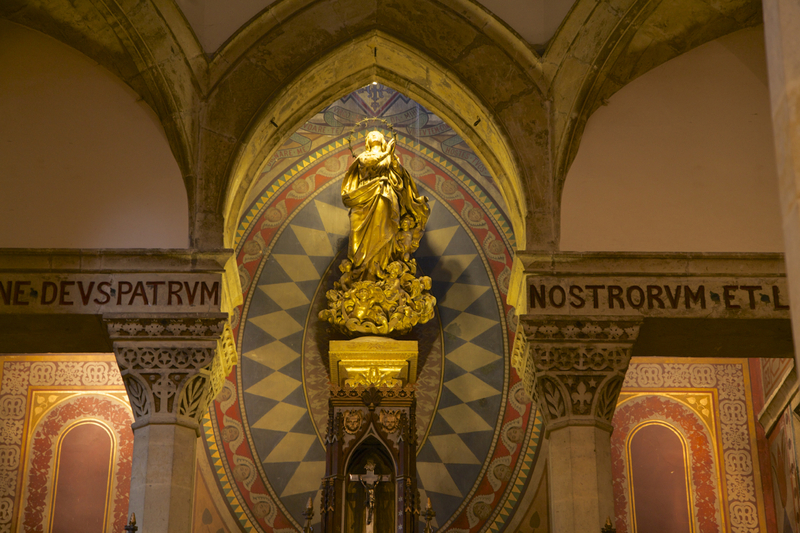 One of the most eye catching features is the gilded statue of Mary above the altar, almost floating towards heaven. Positioned under a skylight (and with a bit of help from human lighting too) she may be the first thing you see when you enter the church. 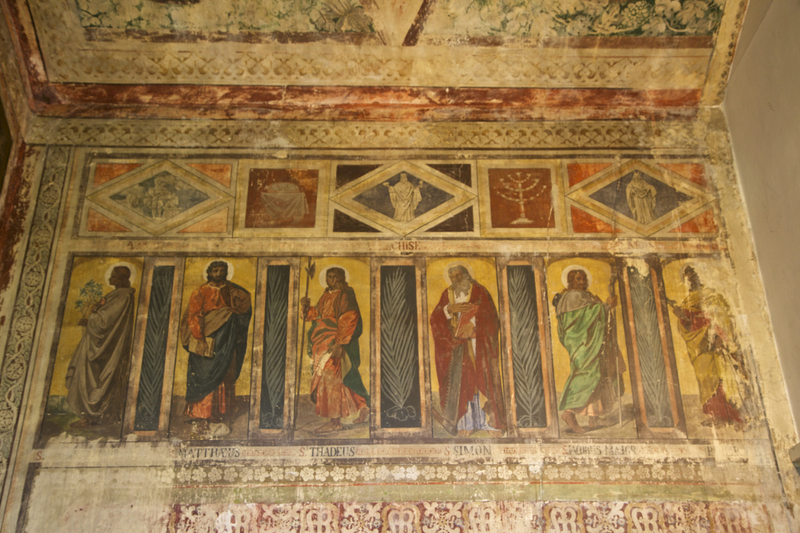 Then again, we’re all different, there are so many details, inscriptions and little treasures to be found that you may see the high painted ceiling (barrel vault) or the imperfections in the treaded floor that leads you to the altar. 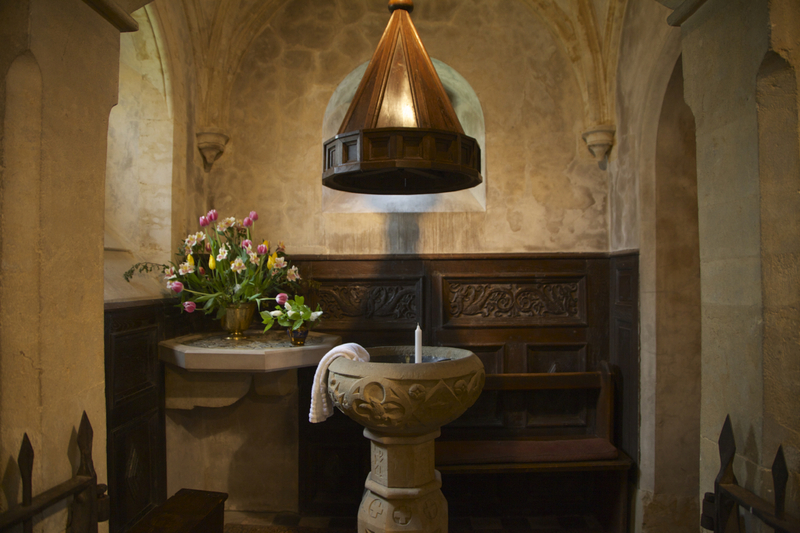 You’ll have to look around to find the baptismal font and its clever cover (check the wooden panelling too as it is from Westminster Abbey no less). 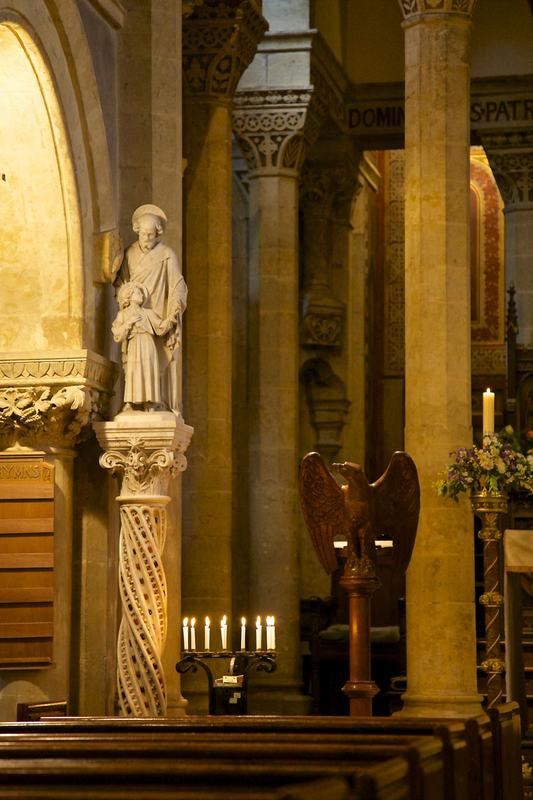 When I was commissioned to take photographs of the church I was lucky to be given a guided tour for my second visit. I won’t show you all the pictures although I took dozens, it would spoil the visit and the pleasure of discovering something you’ve never seen before. Look out for when they have open days to see the whole building. In the church itself, there is plenty to see. You’ll find statues and paintings in alcoves, details in droves. Busy behind my lens capturing a mother in turn holding her baby or her grown son on her lap, I felt like time was stopping for a while, silence around me, away from our busy world, our religious differences. Religious buildings have come to represent our differences in the world, something that pains many of us, yet when I visited this somewhat forgotten labour of love and faith, built by an English aristocrat for his community of believers, I felt a weird and unexpected sense of peace. It was (to my surprise) a descendant of Charles who gave me a tour of the church; her family still owns St Mary (although in trust). Private ownership of churches is one of the many things I learnt in Chideock. Something I had never come across before either is a gallery overlooking the sanctuary for the Weld family to attend mass directly from the manor without being seen from the ground level. Although the family no longer owns Chideock manor, this is an interesting witness to a not so distant past. I must admit I found this feature rather strange, if fascinating, more to do with my French ancestry, of course, than my Catholic upbringing. It made me think of history at large, social classes, lasting separations or forgotten divides. But it also reminded me that although churches are often a story of wealth enabling a building where beliefs can be shared and celebrated to exist, faith and even more so community involvement is now what is preserving the buildings for our future generations. As I visited, the cupola was about to be rebuilt and restored to how it used to be, thanks to funds raised locally over several years. Craftsmanship prevails, wherever the funds come from, whoever the craftsmen are. Here, everybody can come and visit, light a candle, say a prayer or simply have a look around. I’ve only scratched the surface of what you can discover at Chideock catholic church. Whilst I was visiting, three men walked in and went straight to the little cloister adjacent to the church, now a local museum. In the silence of the church, it was easy to overhear their conversation. Here was a father and his adult sons, looking at photographs of a person the older man knew many years ago when he lived in the area. The caretaker was called over to help. Now, was she the butcher’s daughter, or was she the one married to the builder? I left them to their conversation, the father with his revived memories, his sons, the lady of the church and the caretaker of St Mary. We all walked back out at the same time a little while later, drizzle welcoming us to the English countryside, a smile on our faces. I looked back at Mary in her roundel above the entrance. Is that the sun shining behind her? Sounds like a place to go for some quiet time to be able to think and reflect on life and its trials & tribulations.